When the devas (gods) and asuras (demons) started churning the kṣīra-samudra (milk-ocean) with a view to getting amṛta (ambrosia), several divine and mysterious objects emerged, out of which the majestic Airāvata (also called Airāvaṇa) the four-tusked white elephant was one. Indra, the chief of the devas, chose it as his mount. According to another version, Airāvata was the offspring of the elephant Bhadramanasa which Indra claimed as his mount. Indra, who is also the presiding god over rain, sends down rain while sitting on this elephant. It is to this elephant that Indra threw the sacred garland given by the sage Durvāsas, out of arrogance and pride. The animal in turn threw it under its feet and trampled it thus enraging the irascible sage who cursed Indra to lose his sovereignty. 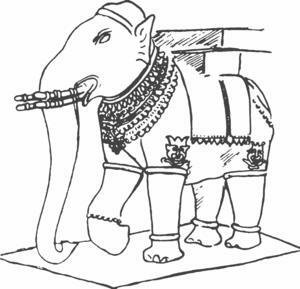 Airāvata is also the name of the elephant supporting the earth on its eastern quarter and is one of the eight elephants known as aṣṭadig-gajas, believed to be supporting the quarters. It is sometimes described as the king of elephants and a prototype of all the elephants (vide Viṣṇupurāṇa 1.22). ‘Airāvata’ is also the name of a serpent king who is said to have protected Aśvasena, the son of Takṣaka (another serpent king).